You'll be £12.99 closer to your next £10.00 credit when you purchase Pocket Guide to Victorian Writers and Poets. What's this? Order within the next 8 hours, 32 minutes to get your order processed the next working day! 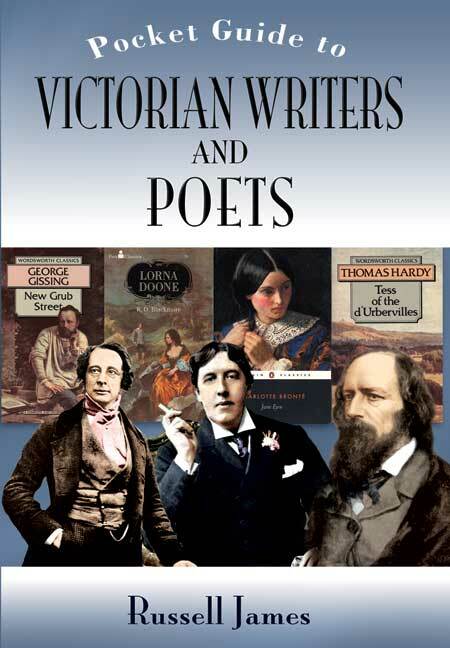 The Victorian era produced many famous writers and poets, including Dickens, Thackeray, H.G. Wells and Tennyson. Magazines like The Strand launched famous creations such as Conan Doyle's Sherlock Holmes, whose cliff-hanger stories were told in part-works to add to the excitement.The poetry was epic, Tennyson's Morte d'Arthur and The Lady of Shalott tapped into the Pre-Raphaelite style so popular in the art of the day. Russell James has explored the role of the Victorian writer and their genres, from Dickens' desire to correct social wrongs and expose poverty to H.G. Wells' desire to escape the modern world. The responsibility of the Victorian poet is also revealed from romantic declaration and escapism to heroism and historical commemorations – would modern generations know about the Charge of the Light Brigade if Tennyson hadn't immortalised it? Together with A-Zs of writers and poets, this is a must-read book for everyone who loves good writing and wants to discover more. All the narrative styles we read today were birthed during the Victorian age. It was the age of discovery and thus documenting such, the era of revolution and fantasising the incredible, one of great triumph, but also great toils and all these were captured in this modern Victorian literature. It is difficult to imagine that these narrative styles were only just being discovered in this era as the most common form of storytelling until this point was in fact verse. Russell James pursues his passion of Victorian literature in his book and delivers to us with unrivalled enthusiasm a collection of the most renowned to the lost and forgotten and a few peculiar treasures, which make a narration by a host of talking animals seem like only the first few cautious steps down the rabbit hole. If you're interests lie in Victorian literature and you require some guidance to the greatest range of undiscovered treasures, surely no other author is as dedicated to the cause than Russell James. The A-Z layout of authors, littered with curious and quirky Victorian pictures makes this an easily accessible guide and a joy to read. A definite companion to any classical literature fanatic. Many of the nation's favourite poems and classic novels are a product of the Victorian age. This indispensible new book provides a fascinating and informative A-Z guide to 250 of the most important writers and poets of this highly productive era. In addition to giving detail of some of their most famous and interesting works, this book also provides some, often rather surprising, background information on the writers themselves – a compelling insight into the inspiration for their extraordinary artistic creations. Frequently steeped in scandal, these writers and their works are some of the most controversial in the history of literature. From the God-defying pioneer of evolution, Charles Darwin to the adulterous hypocrite Charles Dickens and the mournfully repressed Lewis Carroll, the stories of these intriguing characters will inspire many a reader to head eagerly to their local second-hand bookshop and track down some of the more obscure gems uncovered here. In telling the story of these authors and their works, Russell James reveals an entertaining and vibrant Victorian world that is so often lost in other histories among the fog of myth and twaddle. The Victorian era produced many famous writers and poets, including Dickens, Thackeray, H.G. Wells and Tennyson. Magazines like The Strand launched famous creations such as Conan Doyle’s Sherlock Holmes, whose cliff-hanger stories were told in part-works to add to the excitement.The poetry was epic, Tennyson’s Morte d’Arthur and The Lady of Shalott tapped into the Pre-Raphaelite style so popular in the art of the day. Russell James has explored the role of the Victorian writer and their genres, from Dickens’ desire to correct social wrongs and expose poverty to H.G. Wells’ desire to escape the modern world. The responsibility of the Victorian poet is also revealed from romantic declaration and escapism to heroism and historical commemorations – would modern generations know about the Charge of the Light Brigade if Tennyson hadn’t immortalised it? Together with A-Zs of writers and poets, this is a must-read book for everyone who loves good writing and wants to discover more.